Looking for Experienced Male Dentist BDS (Minimum 5 + years) should be able to work independently in all phases of General Dentistry including root canals/ Extraction/ Filling/ dentures etc, to work ABROAD on contract for a private clinic. Vacancy available for a dentist at Dental Care, Hauz Khas. Working experience of 4 To 5 years after graduation. Preferably residing in South Delhi. Required dentist for modinagar dental clinic in ( Dr. Arya’s Dental & Skin Clinic). Interested candidate kindly contact on 7017575732. 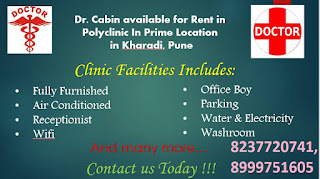 Urgently required BDS for a private practice in Thane (W). Urgently required BDS for a private practice in Kasarvadavli, Thane (W). Dental graduate for a clinic in South Delhi from 4.30 to 7.30pm. please call/ wattsapp on 9910169968. Salary negotiable. We have a beautifully done up Polyclinic with consultation cabins. We are looking to rent out cabins on rent on timesharing basis . Each cabin is around 100 sqft and is air-conditioned and will have a personal examining bed with storage area. A spacious waiting area is provided for patients to wait comfortably. we have a bathroom. Located in a prime location in Kharadi .We are on the upper ground floor which makes it easy for old patients to reach. Working from this clinic will give a classy and professional touch to your practise and give it a chance to blossom. Only interested doctors please contact for more details. Urgently required two BDS graduates. .candidates with good communication preferred..